Don’t believe all you hear about lost cities. But then again, why not? I should have a double Scotch for every time someone has told me where to find buried treasure and secret ruins. Nelly went on, looking round to see that no one else was listening. “It’s got these three lines of great walls, near the top of a hill. There’s a waterfall…”. With lost cities and buried treasure there’s some common characteristics to the stories. One is that they are always second-hand. The most consistently unreliable stories come from priests and protestant missionaries, invariably imprecise and gullible; perhaps it goes with the territory. The most famous in our area was a Padre Polentini, active for decades in the Lares Valley over a cold bare pass from Calca. According to everyone you meet in this attractive but little-visited area, Padre Polentini spent all his time -this would be the ’70s and ’80s– looking for lost cities and of course he built up, the same stories say, a hoard of gold and silver objects which one of the Cuzco archbishops sent off to the Vatican. To add substance to the foggy world of lost cities and buried treasure, there’s a private museum in Lima crammed full of spectacular gold and silver objects that are all grave-robbed. It is much better than the tourist-trap Gold Museum, which is full of fakes. A late-breaking version of the secret hoard syndrome is the story, first published in Caretas’ Country Notes in March this year, that Machu Picchu itself was looted in the 1880s by a German, August R. Berns, and all the huacos were sent off to the Berlin Museum. The discoverer of this gem of lost city-ology, Paolo Greer, is much smarter and more persistent than the professional archaeologists and historians. One of Paolo’s specialties is locating old gold and silver mines, some of which are in production again over on the eastern slopes of the Carabaya between Cuzco and Puno. Today this is one of Peru’s toughest no-go regions, controlled by drug gangs and illegal gold panners. Paolo has also been working on what he calls “Portuguese” silver mines to the East of Machu Picchu. He tried to get up there a few months ago but got turned back by impassable cliffs. Others, led by Gary Ziegler, of Colorado, and Vince Lee, a couple of months ago held a symposium hosted by the Rocky Mountain Chapter of The Explorers Club. I’ve been out many times with Gary in the Vilcabamba beyond Machu Picchu and he thoughtfully combines GPS technology with ensuring that one of the mules is assigned to carry three crates of Stolychnaya with a few bottles of Martini for the women. Technology doesn’t seem to have made the slightest difference to the rate of discovery of lost cities in the Andes. The Instituto Geografico 100:000 maps, produced arm-in-arm with the Pentagon, are still dodgy, because they don’t do much footwork to back up the clever satellites. However, things are a lot easier in the field today with the ferocious accuracy and handy cheapness of GPS machines the size of a telephone. This means that you can draw your own maps, as detailed or as sketchy as you like with spot-on accuracy. But clear thinking is much more important than technology. I instantly realized he was talking about my own National Geographic expedition in 1963 Perú by Parachute – NGS 1964 (link to pdf of article) where, true, I’d had to abandon a couple of torn ‘chutes, a broken 16-bore shotgun and a pile of empty Coke bottles. I explained it all to the priest. He didn’t believe a word of it. In 1925 Col. Percy Fawcett, an English artillery officer, disappeared while searching for a lost civilization in the Amazon and people have, in turn, been looking for him ever since. One early hope in the years immediately following Fawcett’s disappearance was that he had found the lost city and that he and his son Jack, who had accompanied him, were living it up as honoured guests of the inhabitants: they were, after all, English. One of those who went to look for him was Peter Fleming, brother of Ian, creator of 007 James Bond. Fleming’s book about his expedition, “Brazilian Adventure” (1933) was a best-seller. Fawcett went into the Mato Grosso and the Xingu only a few years after Arthur Conan Doyle, inventor of Sherlock Holmes, had published ‘The Lost World”, the best-seller where dinosaurs, warring Indians, vicious man-like apes and intrepid English explorers were stirred into the heart of the Amazon. Hiram Bingham, also, had just discovered Machu Picchu and his photographs had stunned the world. Col. Fawcett and the whacko world of lost cities is the subject of a new book out just this month in New York, “The Lost City of Z. A Tale of Deadly Obsession in the Amazon” by David Grann, a journalist on The New Yorker. ‘The Lost City of Z’ was the description that Col. Fawcett gave to the object of his obsession. The reviews in The New York Times and elsewhere speak well of the new book but in fact others know much more about Fawcett and the Amazon. These are led by a couple of friends of mine; John Hemming, author of the classic “La Conquista de los Incas” and, out just last year, “Tree of Rivers; The Story of the Amazon”. Hemming is also the leading international authority on the wild tribes in the forest. The other is William Lowther who has spent many years on the Fawcett story. Both Hemming and Lowther tell me that Fawcett was “nasty.” Lowther recalls how Fawcett simply left one of his English team members on the Peru-Bolivia frontier to die alone in the jungle after being badly bitten by a poisonous insect. The man by a miracle lived to tell the story. This had happened in 1906 when Fawcett, who was born in 1867, had been hired to survey the Bolivia-Peru frontier which still stands as he defined it. Lowther tells me that “Fawcett was tough and energetic. He worked so fast that the Bolivians paid him a bonus.” They went on to hire him to do their frontier with Brazil, too. It was during this time that Fawcett collected stories of lost cities and lost tribes. As a surveyor, he was also drawing up maps and from my own experience maps quickly acquire their own reality. Fawcett fought through World War 1 on the Western Front in the Royal Artillery and Lowther tells me that he was almost promoted to General. By one of those coincidences Hemming’s father, a mathematician, was one of Fawcett’s junior officers and accused Fawcett later of basing his targeting on an Ouija board. “Untrue!” Lowther says. But these were the great days of Spiritualism and cranky, high-handed Colonel Fawcett believed that you could indeed have contact with the other world. On top of that, like most English people in those days, he was a racist who thought poorly of the forest Indians. He believed that a lost civilization in the Amazon was still peopled by a superior race of which his son Jack was also a member. So all he and Jack had to do, was to get to the right area and the inhabitants would spot Jack as one of their own and welcome him, and of course his father, in! They were certainly killed by Indians. Some of their belongings were to turn up in the market some time later at a town in the area. From my account it may seem as though Fawcett was a basket case who dragged his son to a certain death. Maybe. But Hemming, a great scholar, Secretary for many years of the Royal Geographical Society, has told me how in 1961 he carried out the arrow-filled and battered body of his friend Richard Mason, both recently graduated from Oxford. Nine years later, in 1970, I myself spent months searching for Robert Nichols, a friend, a Peruvian Times reporter who had disappeared while looking for Paititi in the Pantiacolla hills of the Alto Madre de Dios. A year later we found that Nichols, relaxed and amiable but as tough and experienced as Col. Fawcett, had been stoned to death by renegade Machiguengas. You can walk through the middle of a lost city without seeing a thing. Or you can find a couple of stones on top of each other and, mein Gott! I’ve found Atlantis! I’ve done both but we can be sure that Gene Savoy, the great lost city explorer who has just died at 80, never made mistakes like that. Unlike most explorers Savoy, who was not confused by having a degree from Cambridge ni mucho menos, knew what he was doing. He discovered more lost cities than the rest put together. He was often accused of being a huaquero and on a couple of occasions I had to rescue him from some comisaria and rush him into the diplomatic immunity of the Phoenix Club, where he would be safe at least from wives and girl-friends. But actually he hadn’t the slightest interest in the bits and pieces of traditional Peruvian archeology. Savoy believed that the Sumerians, Phoenicians, Essenes and Egyptians had set up great societies in the Amazon which had expanded into the Andes and had then spread up to Mexico. This was his Feathered Serpent thesis. Here’s the focus. It came in an invitation he sent me to a black-tie do in Reno in 1998 to launch his “Project X –the Search for the Secrets of Immortality.” Gene, the Head Bishop of a church he himself had founded, had just survived the break-up of his 73-foot made-in-Peru Mochica Dragon-prowed catamaran sailboat Feathered Serpent III in a typhoon south-west of Hawaii. This had put an end to a projected seven-year round-the-world Grand Ophir Expedition. For nearly half a century Savoy, the Project X blurb said, “has dedicated his life to the search for the secrets of immortality”. Indeed, I remember Gene in the ‘sixties, between his successful Lost City trips into the jungle, chatting in the Haiti Café in Miraflores about south-east Asian monks and holy men living for more than 120 years thanks to yoga-like sexual contortions. The Grand Ophir Sea expedition is “an odyssey in search of clues to a true understanding of the ancients and their global society”. It is “retracing King Solomon’s actual visit to ancient Peru”. King Solomon’s mines were not in Arabia or in East Africa, but here in the Andes, maybe just up the road from Urubamba or, more likely in the north round Gran Pajaten or Gran Velaya, two of his great discoveries. Ophir, referred to in the Book of Kings as a source of immense wealth, was Peru. He’s right. Archaeologists in Peru have provided a miserably boring and unproductive set of stories on what the ruins and remains show was clearly a fabulous set of multi civilizations. It was not much more than a couple of generations ago that many of the sites, starting with Machu Picchu, were fictitious Lost Cities. It was Savoy who located Espiritupampa as the last refuge of the Incas, whacking the academics on the head. They said no, it was just a legend, or that it was Machu Picchu. Sipan, with its eye-popping gold- and silver-ware, only came to light 15 years ago and Carral a decade ago, both of them sitting not in dense jungle but out in the desert. The Nazca Lines were discovered only in 1940, and most visitors think that they’re flying saucer airports. Whatever, the archaeologists can’t tell you what they were and none of them have had an ounce of Savoy’s flamboyant physical and intellectual courage. Salud, Gene! Here in Urubamba Hiram Bingham’s reputation has taken a knock in the run-up to the centennial of the discovery in 1911 of Machu Picchu. The revisionists are saying that Bingham was not just a persistent explorer but also, frankly, a humbug. Bingham’s economical use of the truth has been compounded by the poorly-advised refusal of Yale University and its Peabody Museum of Natural History to return, as promised, what Bingham’s Yale expeditions dug up in the Vilcabamba 1912-15. The Peruvian government is taking Yale to court but they’re not pushing it. Here’s why. None of the good pieces in the Yale Machu Picchu collection were actually dug up by Yale archaeologists. Instead they were bought by Bingham from Cusco collectors and huaqueros and smuggled out of Peru. Under U.S. law Yale is the legal owner. If Yale people had dug them up, it would be Peru that had the legitimate claim. The out-whiffling from Peru of the Yale Machu Picchu huacos is much as Luis Valcarcel, an iconic Peruvian archaeologist, maintained noisily nearly a century ago when he and his Cusco Historical Institute took Bingham to court as a grave-robber. Bingham fled, never to return. The first of at least two major consignments of Inca pottery bought by Bingham and today the pride of the Yale collection consisted of 366 primo pieces purchased by him from Tomas. A. Alvistur who, Paolo Greer, the archivist extraordinaire and systems whiz, tells me was a son-in-law of Carmen Vargas, owner then of the Huadquiña hacienda, just below Machu Picchu. “Both the Vargas family and Alvistur had well-known collections in Cuzco,” Greer says. Most of the 5,000-odd items that Yale dug up at Machu Picchu consisted of broken potsherds and bones. One, Richard Burger, of Yale, told me, turned out to be a piece of tough 1915 camp bread mistakenly labelled and coded by a zealous student. Bingham had quickly realised that others had beaten him to it: Machu Picchu was well-known in Cuzco and had already been sacked. But it didn’t suit either him or Yale to say so. Greer tells me that Bingham visited in 1913 the Berlin Ethnologic Museum to study the collection sold to it in 1882 by Jose Mariano Macedo who, along with Ricardo Palma and other Lima luminaries of the day was a partner of the German adventurer August R. Berns. Alvistur himself put his collection through customs and onto a ship for Panama. Bingham later thanked the shipping agent for helping to make “Yale an efficient place in which to learn about Peru ancient and modern”. My source for all this is Christopher Heaney, who I met in the Instituto Bartolome de las Casas in Cuzco a few years ago. Heaney, who consulted with Greer, did a fine job of putting the Bingham smuggling evidence together and published it in The New Republic, D.C., in October, 2006. Heaney says that Bingham invested $25,000 in purchases, plus costs, of huacos which all went to Yale-Peabody. Bingham, famously, had married money. If Yale had had any sense it would long ago have returned to Peru the boring bits of academic bones and pottery that its people actually found. But it’s hard for Lima politicos to acknowledge that all the good stuff is protected by a statute of limitations. Machu Picchu and the Inca Empire were the creation of an import from Central America, maize, and a dramatic climate shift that turned the Andean highlands from inhospitable wet-and-cold to pleasant, as it is today, dry-and-warm. For more than half a millenium before this shift the high Andes had been miserable. With the new dry-and-warm, starting around 1000 AD, a backwoods tribe, the Incas, put together the new climate and technology breakthroughs and by 1500AD had produced the world’s most go-ahead empire, heavily populated and larger, richer, healthier and better organized than Ming Dynasty China and the Ottoman Empire, its nearest contemporaries. The Incas, like a score of tribes all over the tropical Andes, had moved up over the previous millenia from hunters-and-gathers to llama-herders and, latterly, agriculturalists, farmers of potatoes and quinoa, the top names among a world-class agricultural flora that was famously described in the National Academy of Science’s The Lost Crops of the Incas (1989). Then came maize. New studies, the latest just published in London by Alex Chepstow-Lusty, the Cambridge archeobotanopalaentologist, show that high-altitude, large-kernel maize suddenly became widely established around 2,700 years ago – 700BC. Alex’s work is based on core samples he took from Marcacocha, a pond at 3,350ms asl just 30 miles upstream from Machu Picchu itself. They provide a high resolution (40-100-year) environmental and agricultural history of the heart of the Inca region over the past 4,200 years, encapsulated within 6.3 meters of well-dated, highly organic sediments. In these core samples the maize opal phytoliths first appear in 700BC, early on in an earlier warm-and-dry cycle. The samples record, in general terms, a 500-year cycle of warm-and-dry alternating with another half-millenium of cold-and-wet, though the past 500 years haven’t been as bad as earlier events. Analysis of maize opal phytoliths from four archaeological sites in the Copacabana Peninsula, Lake Titicaca, have also come up with a date for the appearance of commercial maize of 2,750 years ago. Even though Lake Titicaca has always provided a special solar-heated mini-climate, at 4,000ms asl this is an astounding height for a species that started its career in muggy Yucatan 7,000 years ago. “Maize was the last piece in the puzzle of the Andean agricultural package, which allowed an expansionist agricultural intensity threshold to be crossed,” says Alex’s latest study, just published in Antiquity, London. Recent stable isotope analysis of the bones, taken to Yale by Hiram Bingham a century ago, show that the main item in the diet of the inhabitants of Machu Picchu was not the potatoes and high-protein quinoa native to the Andes, but maize. The Incas got their kick-start to fame with the global warming that was also underway in Europe. It was this climate change that allowed Western Europe to emerge from the cold-and-nasty Dark Ages. At the same time as the Middle Ages in Europe were blossoming into the Renaissance, the Incas were developing a sensational re-construction of the natural verticality of the Andean landscape. They created thousands of well-drained flights of level stone terraces, unequalled anywhere, covering whole valleys. Turbulent river-courses were channeled and walled. Not only did the population explode, but the Incas knew how to marshal this key resource. They would put thousands of workmen onto the job just like a modern engineering concern. The Inca understanding of stone, of construction and of hydrology is described by Kenneth R. Wright, a prominent engineer from Denver, in his first-class Machu Picchu: A Civil Engineering Marvel (2000). 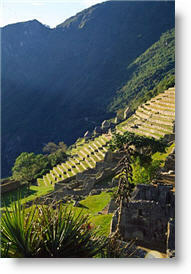 Few of the Inca terraces are in use today. The complicated irrigation flows and long source-channels have fallen into disuse. What they did was to make the best, in the dry-and-warm cycle, of the snow-melt, rivers, streams and lakes, ensuring that agricultural production remained high even during long droughts. Now that we ourselves are into a new global warming it’s certainly time to see how the use of these super-terraces might be resuscitated. The empire was pulled together by thousands of miles of all-weather stone roads and a warehouse network with two or three years worth of strategic reserve food and clothing. These were immediately ransacked, of course, by the Spaniards when they took over in the 1530s. Bureaucrats, another feature of empires, were prominent. Gary Urton at Harvard has shown that the khipu, knotted, colour-coded cords, was a complex mathematical and legal record system that was certainly as competent as the double-entry book-keeping that was being introduced in Europe at that time. Much easier to transport and store, too. Quinoa, a chenopod not a true grain, is much richer in protein than all true grains, so the pre-maize potato+quinoa Andean diet sounds rather healthy. But cereals, starting with wheat, barley, oats in the Middle East and, in the Far East, rice, have invariably provided the high-volume calories that empires need to support cities and armies. No cereal, no empire. 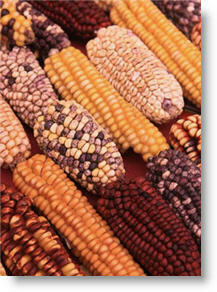 Maize, he adds, is easy to store, while potatoes go bad and get ruined quickly by bugs and blight. I have to say that this new emphasis in the historical record on high-altitude maize comes as a surprise to me, even though I live in the heart of Urubamba, 2,840masl, one of the great maize valleys of the Andes. I have always thought that potatoes were the true Andean basic, with hundreds of varieties backed by a cultural tradition akin to that of rice in China. By the way, the International Potato Center tells me that China is today –surprise— the world’s top grower of potatoes and camote (sweet potatoes). When the last big-cycle global warming began around 1,000AD, the established regimes in the southern Andes, Tiahuanaco and Wari, were unable to adapt and the Incas moved in. Fashionable economists and political scientists today have started to call this “the advantage of backwardness.” This intends to explain, for instance, why China, India and Brazil, basket-cases three decades ago, are suddenly leaping forward into the top ten. A favorite instance are the Romans around 300BC who, regarded as crude barbarians by the Greeks, Persians and Egyptians, quickly took them over and created the world’s best-loved empire. In the Peruvian Andes the Inca country cousins out in the Cuzco boondocks reacted quickly to the drought while the entrenched Wari sat, watched, and disappeared. Their impressively sad capital, Pikillacta, an hour south of Cuzco, is next door to the parish church at Andahuaylillas, the ‘Sistine Chapel of the Andes.’ Gordon McEwan’s masterly Pikillacta: The Wari Empire in Cuzco (2005) is the sourcebook. 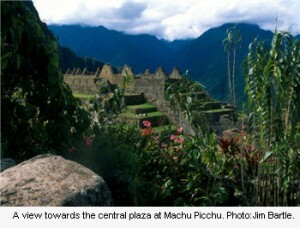 Today the Incas would have won the Nobel prize for agriculture, architecture and another couple for conservation. They planted high-altitude polylepis forests to encourage and capture rain in the high cordillera. We have cut most of these down for firewood. Like the Romans the Incas brought in talent. The stonemasons of Tiahuanaco, metallurgists and goldsmiths from the Coast and agriculturalists from the North. Sadly for the Incas, there was to be no advantage when the Spaniards arrived, to their backwardness in warfare. It took less than five quick years for a handful of Spanish warriors to destroy the monumental achievement of five centuries of a civilization that was built, as Machu Picchu shows, to last forever. “But I am not so sure about the detail of how you portray Wari. For I’d say that all of the elements of statecraft that we think of as Inca: roads, khipu recording systems, and intensification of maize agriculture through terracing and irrigation, in fact had their roots in the Wari Middle Horizon. Indeed, Paul and I would argue that we should add to that list another element still popularly associated with the Inca Empire: the Quechua language family. “This is developed in another article of ours making that case, ‘What role for language prehistory in redefining archaeological culture? A case-study on new Horizons in the Andes’ recently published in Investigating Archaeological Cultures: Material Culture, Variability and Transmission, edited by Roberts, B and Vander Linden, M., pp. 355-386. New York: Springer. 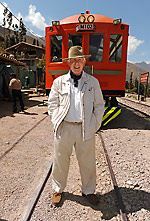 Gary Ziegler, the archaeologist and explorer comments: ”The transition from Wari decline to Inca expansion remains one of the great enigmas in Inca study. “The fall of the Inca was historically determined by the arrival of epidemic disease (likely Bartonellosis from Ecuador and the resulting war of succession following the death of Huayna Capac, not European military superior capability. I suspect Topa Inca would have made quick work of Pizarro’s handful of raiders had they arrived a few decades earlier. “The Wari tomb is not in the midst of the Inca ruins, but several hundred meters away. So it does not look like the Incas found or simply reoccupied an earlier Wari site. As you may know, there are several hundred years separating the decline of the Wari from the rise of the Incas. When I first went there in 1982, Espíritu Pampa was covered by thick rain forest and looked exactly as it did to both Hiram Bingham in 1911 and Gene Savoy in 1964. The growth was so thick that even finding the ruins took quite a bit of work in 1982. I mention this to suggest that a Wari site abandoned there for several hundred years would have virtually disappeared long before the arrival of the Incas. “I note that lots of speculation is turning up that attempts to somehow connect the Wari and Inca cultures via this find, but I’ll be surprised if future work confirms this. This article, without the end comments, was published in Caretas magazine the week of June 27, 2011 in Spanish.